This article is about the collection and promotional cards. For contained packs, see 2018 Mega-Tin Mega Pack. 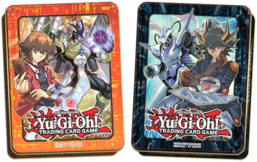 The 2018 Mega-Tins are a set of Yu-Gi-Oh! Trading Card Game collectible tins. Mega-Tins are about 15% larger than Collectible Tins from previous years and only come in one wave. This page was last edited on 11 April 2019, at 23:11.